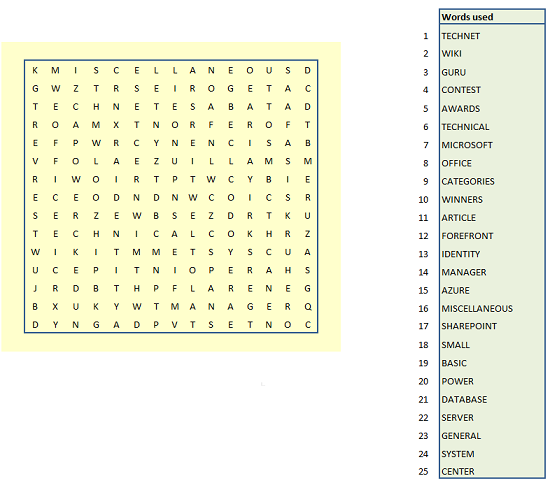 This is an Excel/VBA game that creates wordsearch games in either 10*10, 15*15, or 20*20 format. 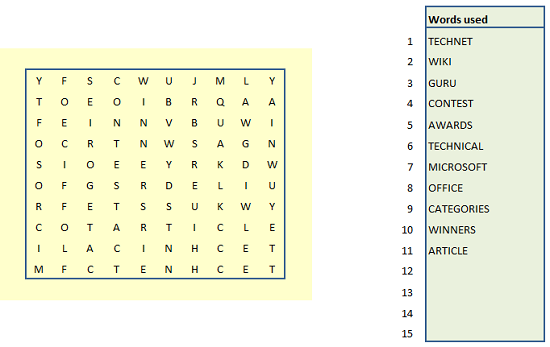 To create a wordsearch, you just need to enter a list of words to use, then click the New Game button. 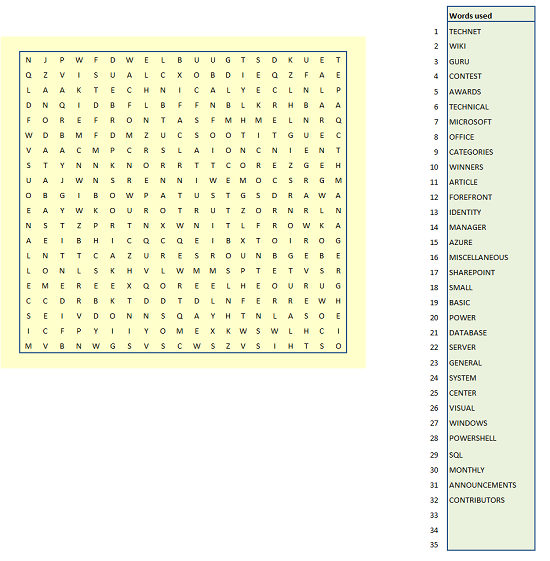 Your new random wordsearch will be displayed as well as a list of words used and statistics about the number of horizontal, vertical, and diagonal words fitted into your wordsearch game. Sometimes you might get disappointing results with only a few words fitted, or uneven spread in the statistics. This is due to the random nature of the game, and you should get better results if you click the New Game button again. Using the Developer Tools in an Excel Workbook, it's possible to add Controls, such as the Buttons used in this game. It's also possible to add VBA Macros to your Workbook. VBA the language used in Macros is very similar to classic VB, and fairly easily used. Macros add additional functionality to your Workbook. A combination of Formulas, Conditional Formatting, and Macros are used in this game. Each cell contains a four element integer array, which stores the grid lines it belongs to (Horizontal, vertical, and 2 * diagonal). These grid lines are used for fitting words in the allCells array. Each cell also contains a four element boolean array, which stores four values indicating which (if any) direction a cell is available for use. Also stored is the text of the cell and the index (1 to w*h) which is used for transposing between arrays. Here the values determined in part 3 are written to the activesheet. Microsoft Office is a versatile valid programming tool for the office developer. This example focuses on game programming, but these tools can be used to create some fairly advanced office software.